Let’s not beat about the bush, river cruising is one of the most relaxing ways to travel. 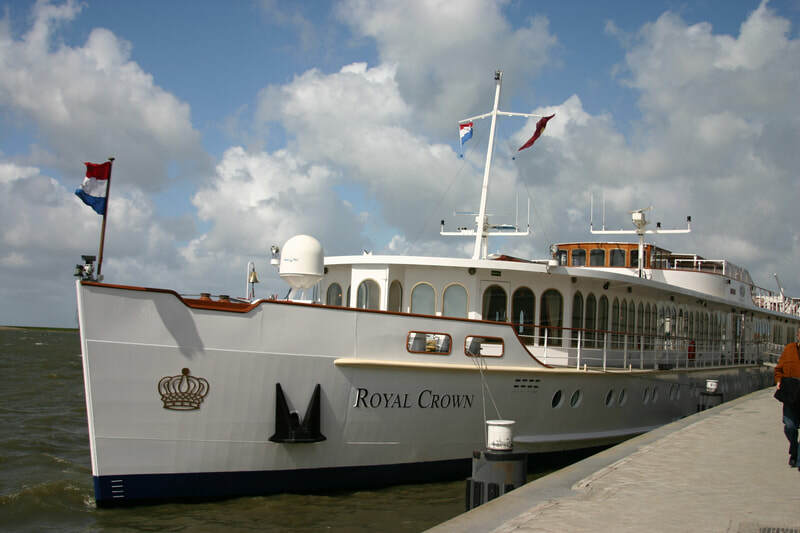 I joined MS Royal Crown in Amsterdam for a short cruise in northern Holland - no mega ship this, no climbing walls, nightclubs or razzle dazzle Vegas style shows, just a timelessly elegant vessel where life’s stresses and strains melt away like ice cream. Smart and white outside, gleaming with brass and mirrored glass within, this ship takes a maximum of 88 guests. Its magic whisks you back in time to a glamorous bygone era, so passengers enjoy a celebration of the decadent sophistication of the Golden Age of Travel, a time when the journey itself was the luxury experience and not just a means of transport. After settling into my Art Deco style 'Royal Suite' with its polished bronze, glass mosaics and fabulous picture windows - just the ticket for viewing the passing landscapes - I met my fellow guests in the comfortable lounge bar. Glasses clinked in toasts as we set sail against the setting sun for Hoorn, a former Dutch East India Company town awash with monuments and museums. Under the expert eye of the executive chef, tantalising meals are created. Fortunately passengers needn’t feel too guilty about tucking in, because Royal Crown has a small gym, sauna and a few bicycles which guests can borrow for shore excursions when the ship is moored. Throughout the meal which elicited paeans of praise, the wine kept on flowing as we did what people do over good food and wine – get to know each other. The after dinner entertainment was provided by a pianist and singer. During this cruise on the Ijsselmeer, Holland’s huge manmade lake, we visited the fishing village of Volendam, famous for its smoked eel. Picasso and Renoir liked to spend time here, it used to be an artists' retreat. A dwindling number of locals still wear traditional dress including the impressive tall bonnet favoured by some elderly fisherwomen. Volendam’s famous neighbour is Edam, known far and wide for producing those red paraffin wax coated, rubbery spheres of cheese. On the last day we stopped at Enkhuizen to grab a slice of yesteryear. 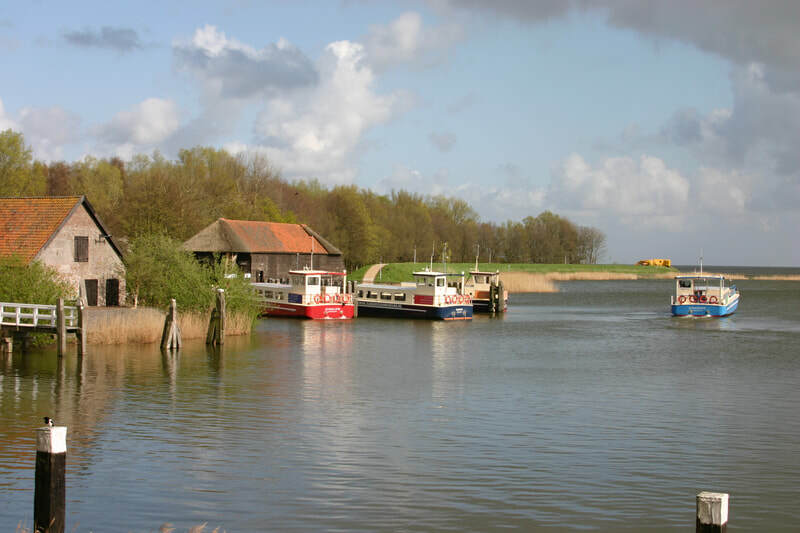 This town’s main claim to fame is the Zuiderzee Open Air Museum. It is in two sections, the Binnenmuseum (Indoor Museum) and the Buitenmuseum (Outdoor or Open Air Museum). Costumed staff demonstrate crafts from everyday life between 1880 to 1932, laundering clothes, shoeing horses and preserving herring by smoking them over wood chips. This complex of 130 buildings includes a cheese warehouse, grocer’s shop, bakery, post office, brush maker, confectioner and apothecary. There are also farm buildings where sheep, goats, pigs, chickens and rabbits wander around and carp and ducks swim in the canals. Kids can make merry by playing old-fashioned games with hoops, hobby-horses and stilts, make skipping ropes, dress up in traditional costumes and learn how to write with a dip pen in a bygone-age classroom. This is one museum that doesn’t have to work too hard at being different. Uniworld, Riviera Travel, Saga, Emerald Waterways and Titan operate Dutch river cruises.